'Over the past few years, club life has become a bit corporate, with VIP rooms, sponsors and in-it-for-the-dough promoters and DJs. Where is the enthusiasm, the chaos, in this brave new world of blinking technology and oiled abdominals? The answer is that you have to dig a little. 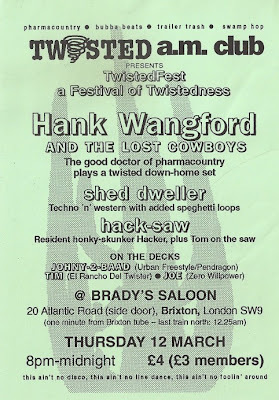 For instance, at a back bar in Brixton, Twisted club heralds a return to the spilt beer and out- by-midnight approach to nightlife that ruled in the Seventies and early Eighties. But it adds its own unique contemporary hybrid in the music it favours: country and western, mixed with dance tracks. "I've always loved country and I want to show that it isn't a dead music form," says Tim Perry, co-founder of Twisted with Piers Hawkins. 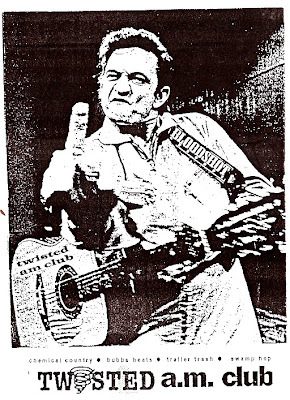 "Jazz blues and world music have all crept into dance music, so why not a few country chords?"... Perry and Hawkins have had great fun thinking up names for their genre, among them Pharma Country, Honky Skunk, Trailer Trash, Swamp Hop, Fucked-Up Country and Bubba Beats. "I'm reminded of the Blues Brothers joke, where they say they play both kinds of music - country and western," says Perry, "except that we play country and techno." 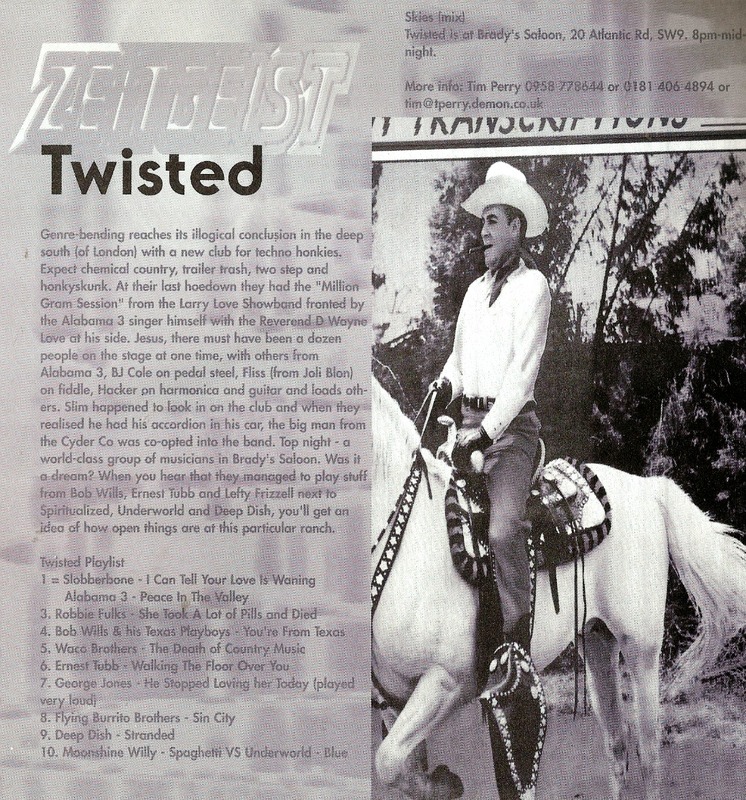 Patsy Cline, Kenny Rogers and Dolly Parton spin alongside dance sounds like Fatboy Slim and Orbital, interspersed with live acts like the local acid-country supremos Alabama 3 and guest appearances from the likes of Chip "Wild Thing" Taylor' (Independent, 15 March 1998). Alabama 3 set the chemical country template with their debut Exile on Coldharbour Lane album in 1997 (Brixton's Coldharbour Lane is just round the corner from Brady's), and indeed their song Peace in the Valley gave the club it's name: 'she feels so twisted, she ain't never gonna fix it, she's just waiting for the light to shine on a brand new day'. Their genius was (and still is) to recognise that country's melancholic tales of addiction and redemption could speak to a generation coming down from ecstatic peaks. 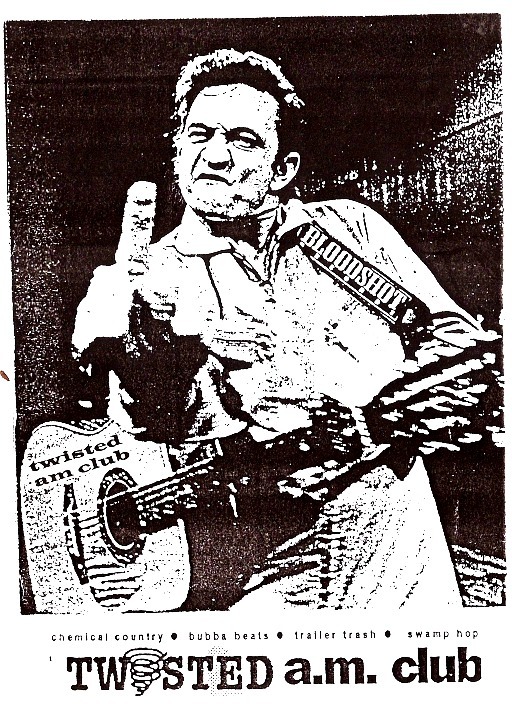 The band were strongly associated with the club, and truth to be told were arguably the only outfit who successfully integrated electronic sounds with proper Hank Williams-style heartache. Just bringing in a few country elements to clod-hopping 4:4 beats was a recipe for Cotton Eye Joe-style cheese in less skilled hands. So the music policy at Twisted was more a case of playing country alongside techno, rather than lots of attempted country/techno hybrids. 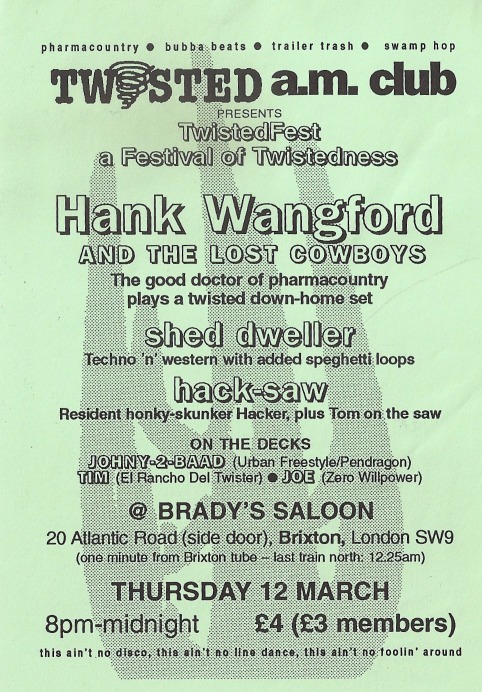 For instance at the night featured on this flyer (which I was at with my late friend Katy Watson), Hank Wangford played a straight country set. ‘Genre-bending reaches its illogical conclusion in the deep south (of London) with a new club for techno honkies. Expect chemical country, trailer trash, two step and honkyskunk. At their last hoedown they had the Million Gram Session from the Larry Love Showband fronted by the Alabama 3 singer himself with the Reverend D Wayne Love at his side. Jesus, there must have been a dozen people on the stage at one time, with others from from Alabama 3, BJ Cole on pedal steel, Fliss (from Joli Blon) on fiddle, Hacker on harmonica and guitar and loads others. Slim happened to look in on the club and when they realised he had an accordion in his car, the big man from the Cyder Co was co-opted into the band. Top night –a world-class group of musicnas in Brady’s Saloon. Was it a dream? When you hear that they managed to play stuff from Bob Wills, Ernest Tubb and Lefty Frizzell next to Spiritualized, Underworld and Deep Dish, you’ll get an idea of how open things are at this particular ranch’. 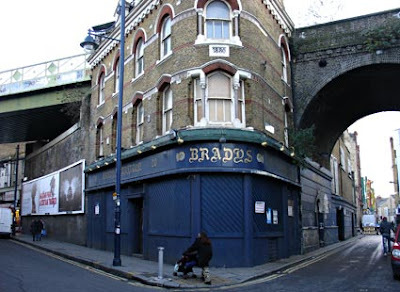 The Railway/Brady's closed down in 1999, and apart from a brief period as a squat venue, has been sadly empty ever since (full story at Urban 75 - from where the photo below was sourced). Along with the George Canning (now Hootananny), it was a place where drinking went on late into the Brixton night. The front bar in its Railway days was mostly frequented by older African Caribbean men, playing pool in front of murals of island scenes. The back bar was more Irish/squatters/SW9 itinerants - I remember being in there one night at a London Celtic Supporters Club social with a band called Athenrye banging our republican songs. There was also a band called the Dead B Specials who used to hang out there. Its relaunch as Bradys music bar later in the 1990s didn't signify much change apart from a few candles in bottles - it was still messy and drunken with the occasional punch up and the less occasional table being knocked over. I saw the Dead B Specials at Brady's. Unless my memory has been clouded by gin, I think they did a rather splendid version of the theme from Z Cars. I think I saw Athenrye at the Swan in Stockwell. The worst disco sleeve of all time?